Put crab meat in boiling salted water along with ginger piece and cloves. Cook about 15 minutes, until meat is tender enough to flake with a fork. Drain, flake and set aside. In a heavy pot, heat oil to a moderate temperature and add other ingredients in the following sequence, stirring for a minute or so between each: onions, ground ginger, tomatoes, tomato paste, green pepper, paprika, cayenne and dried shrimp. Reduce heat and simmer for 4-5 minutes, stirring constantly, until vegetables are cooked. Add crab meat and stir another couple of minutes to heat it through. Then spoon the mixture into clean crab shells or ramekins (small, individual baking dishes). 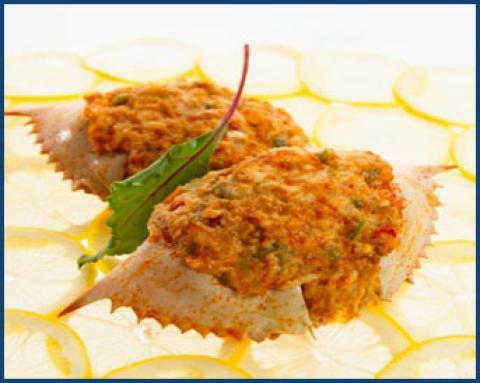 Sprinkle bread crumbs on top of each crab and toast under an oven broiler, being careful not to let the crumbs scorch. Garnish with egg and parsley.